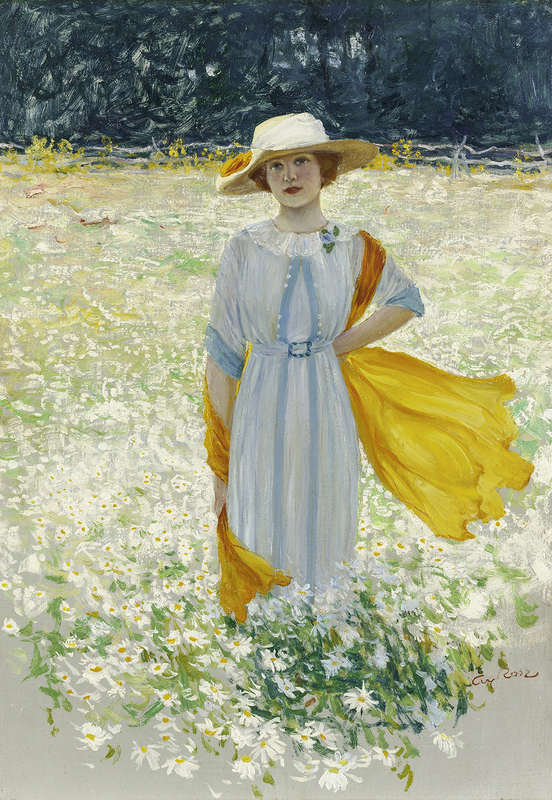 We are delighted to confirm that the Guy Rose painting descriptively titled “Young woman in a field of daisies”, lot 41, was used as the cover illustration for the June 1914 issue of Woman’s Magazine. Considering the political intentions of the publishers of The Woman’s Magazine, namely to elevate women out of second-class citizenship through its content and in conjunction with the formation of political rights groups, it is important to reframe Rose’s painting in the context of the women’s rights movement and political climate of the period. When Rose painted the cover portrait for pro-suffrage periodical The Woman’s Magazine, his choice to depict a bold, modern woman in a pose that exudes independence and self-assurance indicates that he was aware that he was referencing the period’s active woman’s rights movement. With origins dating from before America’s Declaration of Independence, when Abigail Adams asked John Adams to include language in the document giving women equality to men (he didn’t), the woman’s suffrage movement continued to grow steadily in the early 19th century. From the beginning, women used publications to promote their message, including the Woman’s Journal started by suffragettes in Boston in 1870. In 1878, the Woman Suffrage Amendment was proposed in the US Congress for the first time (and the exact wording was ultimately used in the 19th Amendment ratification in 1919). By the 1880s and 1890s, after decades of increasing politicization by women for their rights, suffrage was a mainstream conversation in government and, one by one, states took up the issue with increasingly positive results for the women’s movement. At the turn of the century, Edward Garner Lewis and his wife Mabel Gertrude Lewis were politically active magazine publishers in Missouri. In 1907 they created the American Woman’s League as an alternative way to market their pro-suffrage magazines, The Woman’s Magazine and Woman’s Farm Journal. Rather than individual sales representatives making commissions from selling the magazine directly, payments went to support membership and benefits at 700 chapters around the country. The chapters served to concentrate like-minded women into organized women’s clubs. In 1911, the Lewises founded the American Woman’s Republic whose intention was to educate women in government in order to prepare them for when they received the right to vote. On March 3, 1913, about a year prior to Rose painting the present image, a vocal leader of the suffrage movement, Alice Paul, organized a major Woman Suffrage Procession in Washington DC that coincided with Woodrow Wilson’s inauguration. Approximately 8,000 women marched down Pennsylvania Avenue to the White House while a half-million supporters and harassers watched. In 1914, Paul founded the radical National Woman’s Party after a split with the more mainstream National American Women Suffrage Association (originally led by Stanton and Anthony) and rebranded the traditionally British suffragette colors of purple (for loyalty and dignity), white (for purity), and green (for hope), by replacing the green with gold. Gold was a long-standing color representing American women’s rights that began when Anthony and Stanton chose the Kansas state flower, the sunflower, as the symbol of the suffrage cause, and the flower’s golden-hue was used in pins, ribbons and sashes. The fabric color intended to represent gold in period suffrage ephemera often closely resembles the bold orange hues Rose chose to accent his painting. Perhaps Rose is directly referencing the golden symbol unique to American suffrage in his figure’s dress, and perhaps the daisies also obliquely reference suffrage-symbolic sunflowers as the two types of flower blooms share similar shapes and golden elements. Rose’s painting for the June 1914 cover of The Woman’s Magazine appears to follow the periodical’s history of tackling the issue of suffrage head-on. The figure’s modern dress, hat and pose matches that of other depictions of American suffragettes from the period, and the bold and intentional color choice of golden-orange hued accents may also reference the woman’s rights movement in America. Moran’s California & American Fine Art auction is scheduled for Tuesday, October 23rd, and will begin at 6pm. Moran’s inaugural Women in Art auction will precede the California & American sale at 4pm. The auctions will take place at Moran’s headquarters in Old Town Monrovia: 145 E. Walnut Ave., Monrovia, CA 91016. Free public preview for both sales are scheduled for Friday, October 19th through Monday, October 22nd from 12pm to 4pm each day. Doors open on October 23rd at 12pm. Online bidding is available via Liveuactioneers, Auctionzip and Invaluable. Bidding is also available via telephone, absentee and, of course, in person at Moran’s headquarters.